As we move through life, we get bogged down with day to day activities and might find that small pieces of our financial puzzle get neglected. These neglected areas can have a negative impact on our ability to meet our goals. If you can positively answer the ten questions below, you are certainly putting your best financial foot forward. Jim Blankenship is the founder and principal of Blankenship Financial Planning, Ltd., a financial planning firm providing hourly, as-needed financial planning and advice. A financial services professional for over 25 years, Jim is a CFP professional and has earned the Enrolled Agent designation, a designation that qualifies him as enrolled to practice before the IRS. 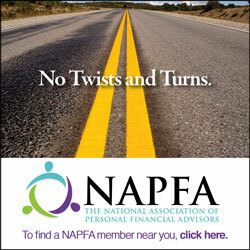 Jim is also a NAPFA-registered financial advisor, which designates him as a Fee-Only Financial Advisor. In a recent article I pointed out a few additional reasons that might make you want to rollover your old 401(k) plan into an IRA – but there are also good reasons, in particular circumstances, that it might make sense to move your IRA funds into a 401(k) plan. One of those reasons might be to avoid having to take Required Minimum Distributions (RMDs)if you’re over age 70½ and are still working. The Social Security Administration has a special way to treat former spouses differently from widows and widowers with regard to benefits when the person in question remarries. This only affects ex-Spouses while the other partner from the former marriage is still living. When the former spouse dies, the surviving spouse is treated as a widow or widower.